A couple of days before we left for Louisiana, I was in the kitchen and Caleb was in his room playing and I heard a weird music sound. (This is where I wish I could upload videos from my phone to the computer.) So I went to check on him, and he had stood up by the piano bench and was reaching up and pressing some of the piano keys. It was so cute, his head didn't even reach the base of the keyboard. 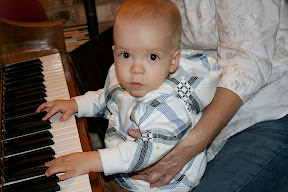 So when we were in Louisiana, that was his favorite thing to do, play the piano. Every time we would open it up and start playing some of the keys, he would get the biggest grin on his face and hurry over to the piano. 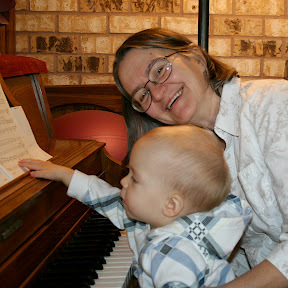 "I wanna play this song, gramma!" Can you send the videos from your phone to your email? That's how I get the videos from cell to computer. Just a thought. Anyway, you take good pics Jen! Hope you had a Merry Christmas! Cuidate. Go to the video on your phone and select options, you should be given choices of what you want to do, one choice should be "send as video message" or something similar, so select that and instead of typing in a phone number select abc's and type in email address. Call me if you need further clarification. I tried calling you but no one answered . . .